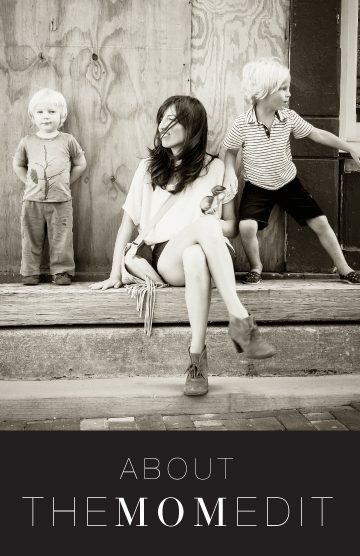 We love LOFT for all of its pretty little things: flirty dresses, cozy sweaters, and tops with cool details. 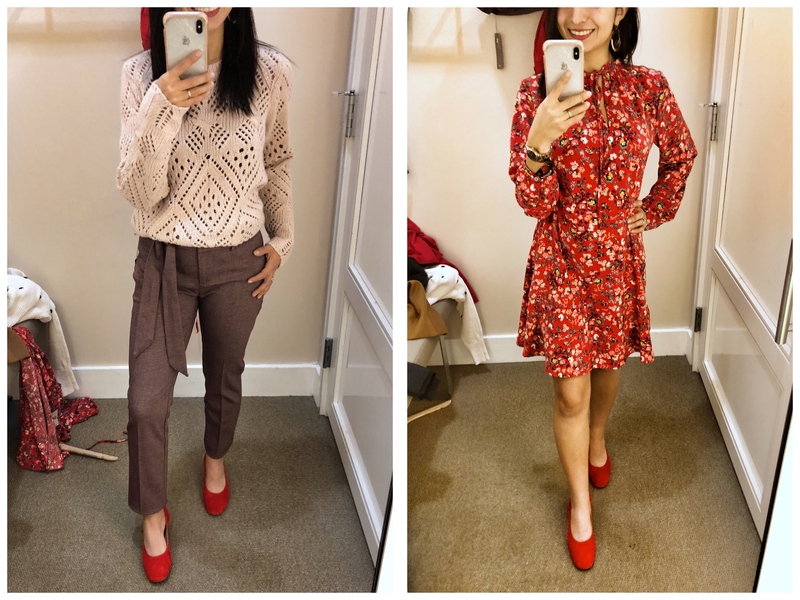 This round of Dressing Room Selfies did NOT disappoint (and most of it is now on sale). ps. 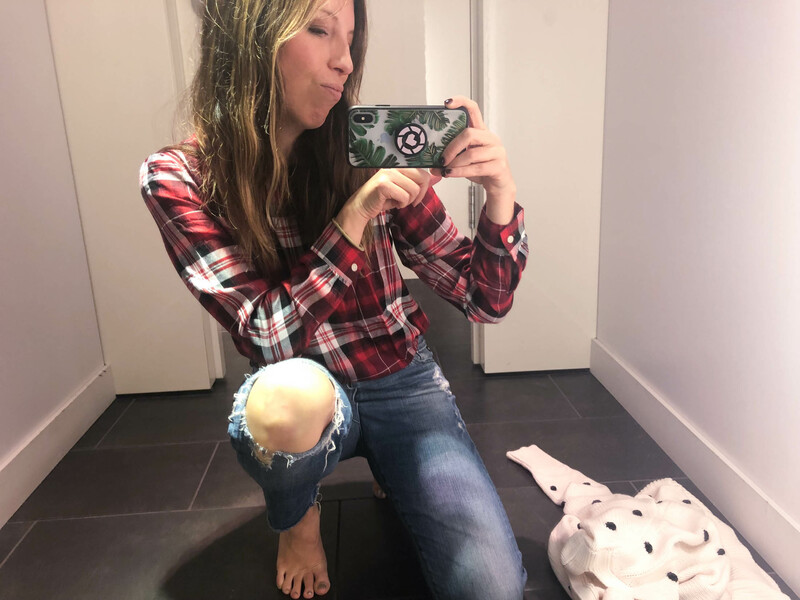 For more Black Friday favorites, as well as Dressing Room Selfies from other retailers, check out our Black Friday Page. An easy win? 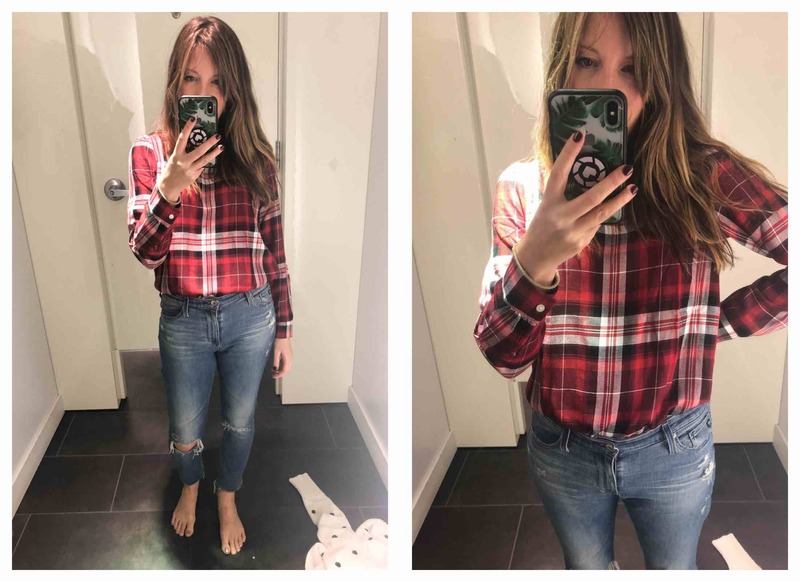 This plaid top. Soft and cute and a more modern version of a plaid flannel button-down. 2. If Sweatpants and Trousers had a baby…. If I still had to work in an office, this is what I’d wear everyday. 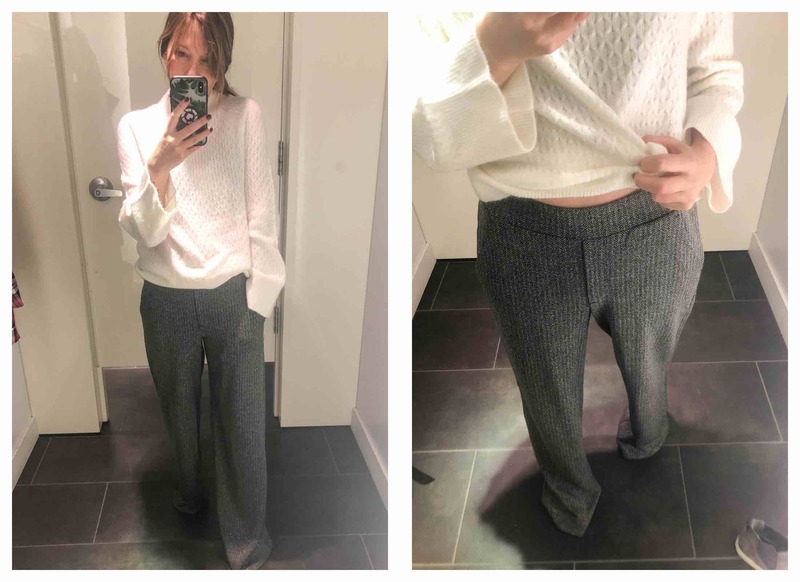 The herringbone trousers are just pull-on pants all fancied up (it looks like I need a petite size, haha), the sweater is just soft fluffiness, yet it all looks so put-together. 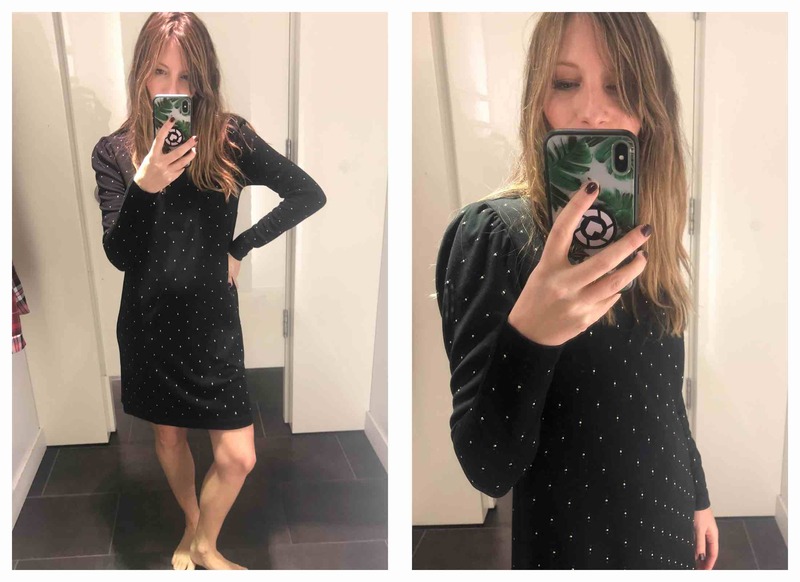 This dress is almost like a sweatshirt dress, but it’s smoother, softer, and slightly thinner than a typical sweatshirt. Also, it has STUDS. Nuff said. ONE: Faux Fur Infinity ScarfShimmer Dot Shirttail Sweater – So cozy and soft. I’m a sucker for these lux cowls this time of year. I’m also adoring this gold and navy. OMG. Love it with the leopard print boots. Wearing size Small. TWO: Lou & Grey Flecked Tunic Sweater – This is one of my favorite finds. I love the flecking and the gorgeous rosy color. The split hem, longer sleeves and heavier neckline make it both updated and flattering. LOVE! Wearing size Small. This cute chenille hat with the pom pom is super-soft and a kinda lux version of a knit hat. Super cute. THREE: Floral Embroidered Striped Blouse – This is such a lovely top that would work for any time of year. I always love an ivory lace option for the holidays. I think I should have tried the XS though, so you may consider sizing down. I’d pair with pretty velvet pants and my leather jacket for any upcoming events. Wearing a Small. ONE: Faux-fur vest – It was probably the first thing that caught my eye upon entering the store. I put it on the outfit I was wearing that day right away! TWO: Chenille pom pom hat – My sister, who loves hats, fell in love with all the chenille hats. They are a perfect way to give life to winter. 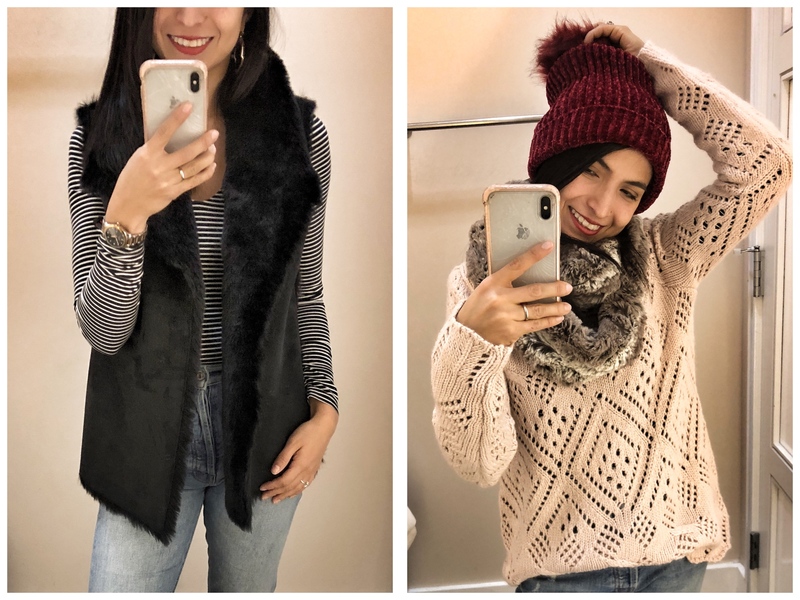 Faux fur infinity scarf – Last year I got a faux fur scarf from loft, I love it. This year comes in an infinity style. ONE: Signature Cardigan – Wearing XS. 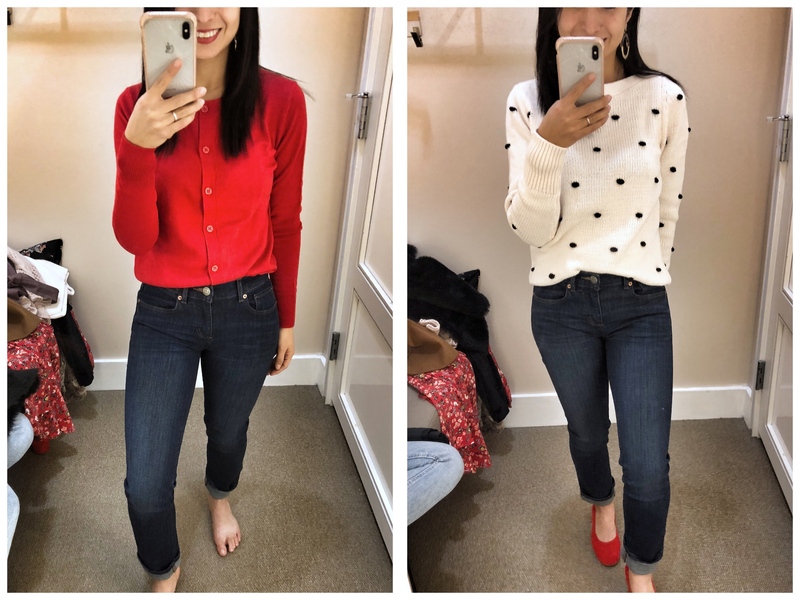 I love wearing these cardigans buttoned up as a top and tucked into my pants. | Modern Straight Leg Jeans – Size 25. Good dark wash. Mid- to low-rise. TWO: Bobble Stitch Sweater – Wearing XS. The perfect sweater when you want to be warm and stylish at the same time. Probably one of my favorite things I tried on. | Modern Straight Leg Jeans – Size 25. Good dark wash. Mid- to low-rise. 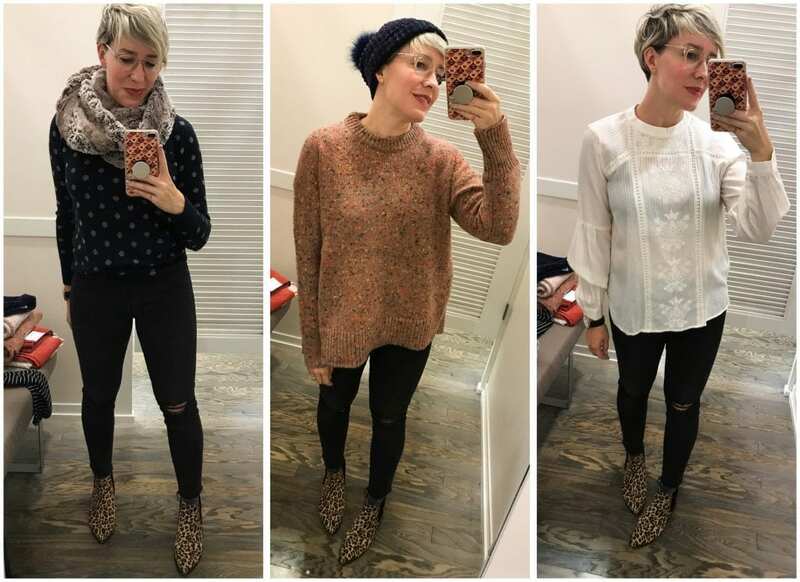 ONE: Lace knit sweater – Really beautiful sweater, I grabbed it right after I saw the purple pants and thought the color combo would be beautiful. You can wear a long sleeve warm layer under it. It comes in grey and ivory. | Slim Tie waist Pencil Pants – They run big. The color of these pants is AMAZING. I loved trying it on with light pink and red. TWO: Primrose Tie Neck Flare dress – Holiday dress done! The colors and fit will make you feel like a million bucks during the holiday season and well into next summer. But what are Julieta’s red shoes? 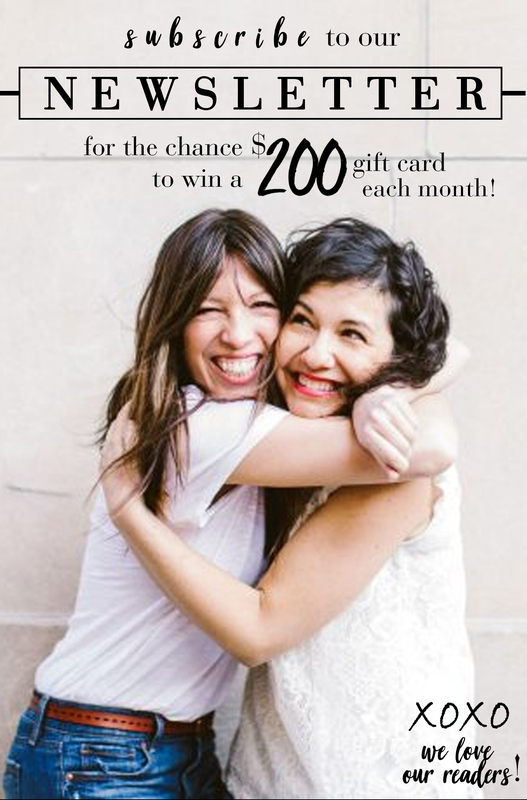 Laura – you’re killing it! LOVE all three tops and the way you styled them. Btw, where are your black pants from? Thanks!